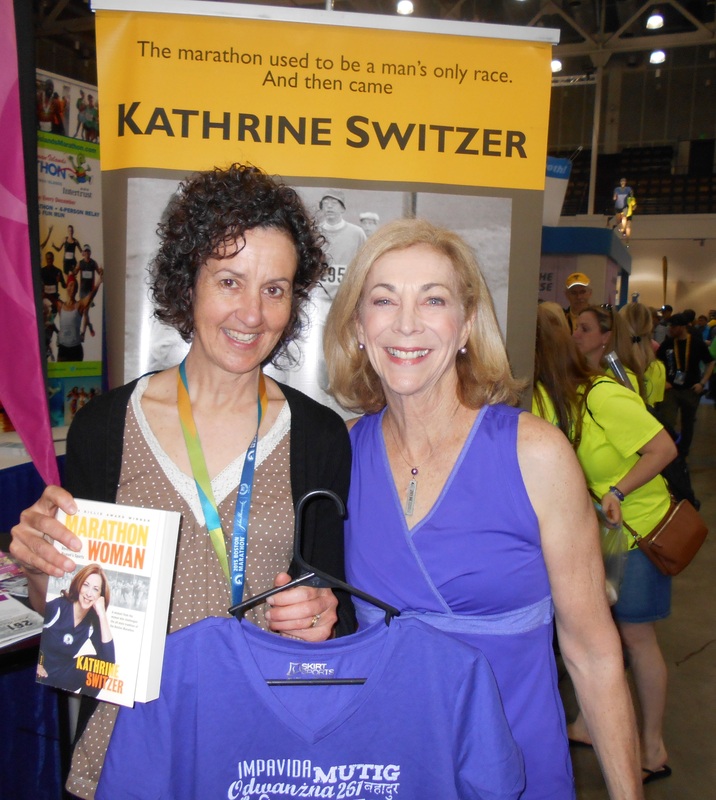 Kay Stairs, left, met Kathrine Switzer, the first woman to run the Boston Marathon, during pre-race festivities of the 2015 event. Stairs qualified for and competed in the race for the first time last month. Photo Submitted. This story ran in the Fredericton Daily Gleaner May 16. Midway through training for an attempt to qualify for the Boston Marathon, Fredericton’s Kay Stairs got married. Several days after tying the knot, Kay and her husband Richard spent a few days in Saint John and the couple celebrated by tying their sneakers and taking to the roads of the Port City. “We just went down for a few days after the wedding and proceeded to go out for a 20-mile run,” said Stairs, chuckling at her fitness regiment in February 2014. 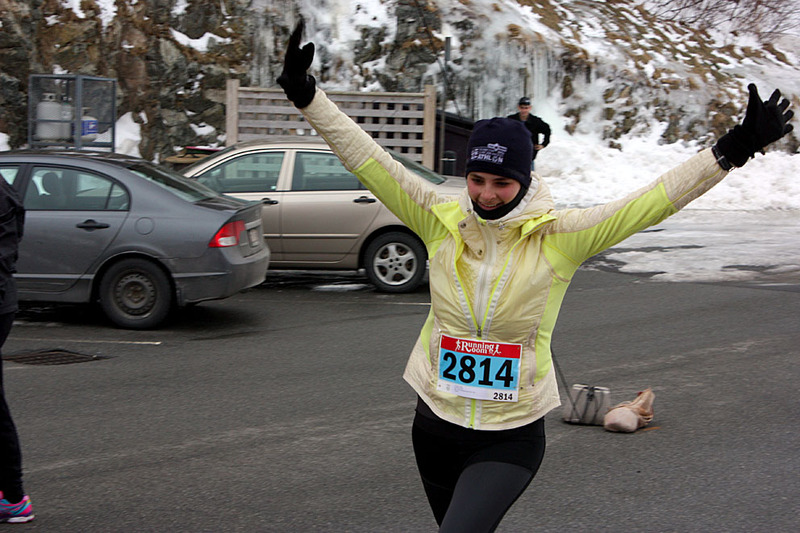 Molly celebrates as she crosses the finish line of the 2013 Hypothermic Half Marathon in Saint John. As I neared the top, I heard Dad say: “It’s your race now.” I knew that was code for: “Time to relax. You’re going to reach your time goal.” The final metres were downhill. I crossed the line with my arms in the air. The rest of my family and my fiancé were waiting there. Because of their support, and my decision to finally believe in myself, the “last person on Earth to ever like running” had completed her first half-marathon in 2:27. Molly is another one of those eager Saint John Streakers I talked about yesterday, one who took on the December running challenge and another who also happened to work at Brunswick News when I was there. We seemed to develop into an avid running crew! Molly, like many, has used running for fitness reasons, hoping to lose weight after earning her degree and in less than one year, did remarkable job. Definitely, many can identify with that goal. As has been the case with other runners in this series, Molly also understands the many benefits fitness and running provide. And for her, those benefits are personal and powerful motivators. 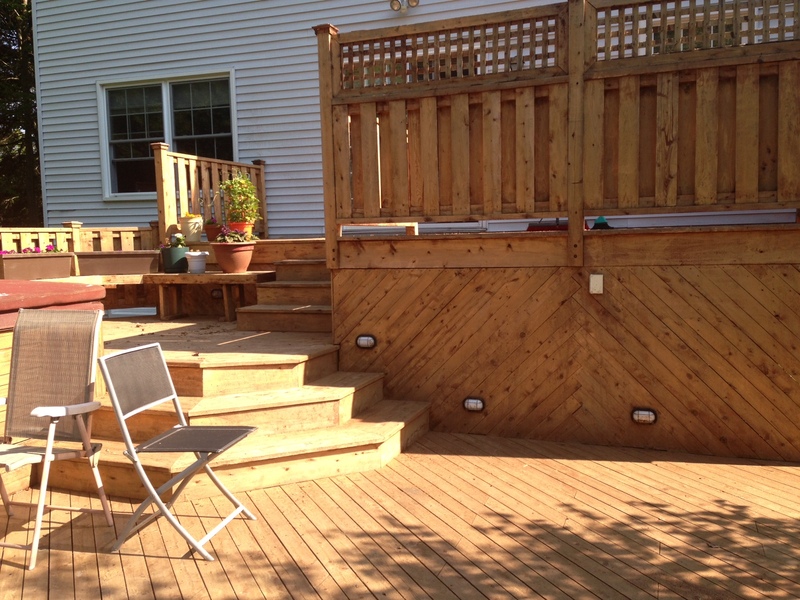 The Long Run – three weekends and more of bringing our once tired deck back to life. “Oh, about 4-5 hours,” I said with confidence when asked how long it would take to rejuvenate our somewhat neglected patio deck. Well, after three weekends and with another 5-6 hours of labour in the forecast, it is slowly coming together, transforming from its previous grey and faded state into a sharp Redwood colour. It is getting close to 30 hours now and definitely adding a challenge to the weekend running. That is especially so for the long runs, which for the past two weekends, started at or around 9:30 p.m. The deck has a number of detailed challenges and I think running has assisted my energy levels in tackling them in the various stages. But this Sunday was a big one, as the first two gallons of stain were applied in the heat of the afternoon. Considering my previous long run was an exercise in fatigue through heat and humidity, I wondered if this week’s effort would develop into the same thing. Working in my favour was a significant temperature decline of 8C to a reasonable 19C, and a slight wind off the river, which translated into a nice run – after the staining exercise. Building on the poor performance a week earlier, I started slow and took it easy on the first 12k of a 24k run, averaging about 6:29 per km (aiming for 6:35-6:40). I read last week that controlling your speed is easier in a group setting and that is something I may want to entertain in the coming weeks, when the volume eventually hits 32k. Feeling good at halfway, I opted to try and increase my speed from 20 per cent above Marathon Pace to 10 per cent above MP, or 6:00-6:05 per km. I broke that 12k into four 3km segments, and for the most part, it was pretty evenly paced, if not slightly fast at about 5:50-5:55 per km. Overall, though, I was happy with my effort this time, despite worrying about energy lost on the deck. It did not seem to have a dramatic impact as my 6-km splits were as follows 39:10; 38:43, 35:16 and 35:04. The last split was nice because I have to prepare for the P.E.I. Marathon and its tough finish of three significant hills, starting around the 35km mark. I plan to finish the long runs with two big climbs at the end (eventually three) to prepare for that late Island challenge. Also, the long run produced a nice negative split of more than seven minutes, so all in all, a decent result. Now, if I can just finish that deck. Sunday long run – 24km @6:11. First quarter 6:38; 6:39; 6:27; 6:29; 6:36; 6:23. Second quarter 6:25; 6:33; 6:24; 6:30; 6:31; 6:21. Third quarter 5:57; 6:02; 5:48; 5:50; 5:46; 5:53. Final quarter 6:01; 5;45; 5:51; 5:42; 6:0; 5:43. Other than volume associated with the long run, which I do not really fear, the most troubling training session right now is the Tuesday session or Lactate Threshold run, where you – in this case – run 8km at half marathon pace as part of a 14km effort. That pace, for me, is 5:00 per km and judging by earlier efforts, represents quite a challenge. I have gone 6, 7 and 8km in this format to date and it is a great feeling – when it is over. Wednesday has an 8km recovery and Thursday sees a 16km general aerobic run on the slate. It started slowly but just after I began Saturday on a recovery pace for my 8-km run, the skies opened up, and the pouring rain was accompanied by plenty of thunder and lightning. Canada Day brought out a rare sight in Quispamsis Monday – the sun. For much of the past week, the prevailing conditions were rain, clouds, darkness and relatively cool temperatures. Mind you, since I had a few extended runs scheduled in my training for the P.E.I. 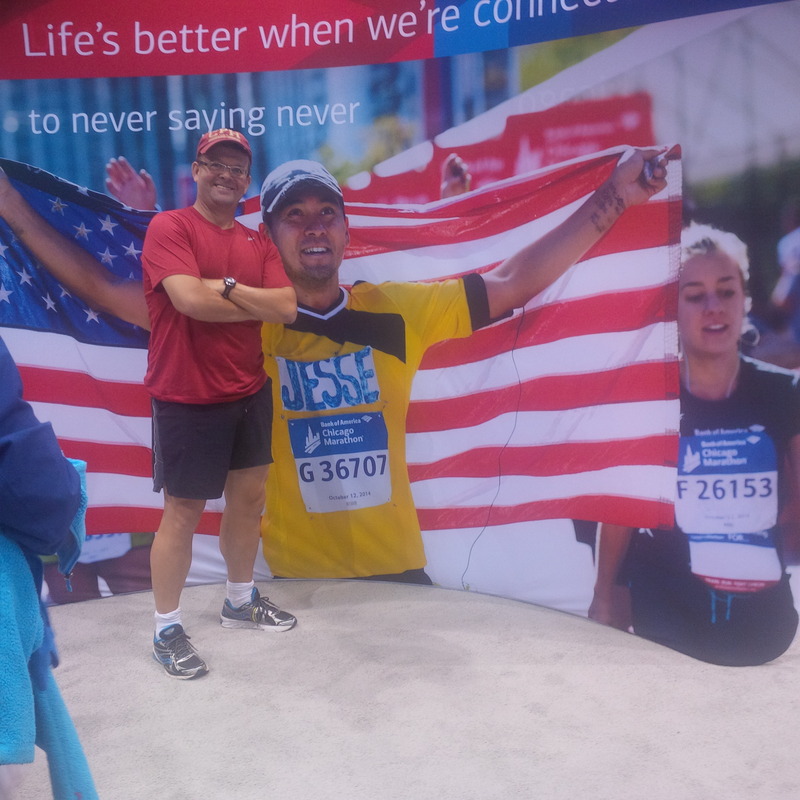 Marathon, I did not mind the conditions that much. 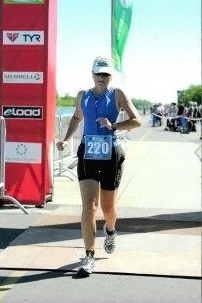 In fact, two of my most enjoyable runs ever happened in cloudy, cool or rainy conditions – Fredericton half in 2012 and PEI 10K in October 2010. But this week, two runs were interrupted by Mother Nature. First, the strides workout I had planned for Tuesday was altered to a tempo run on the treadmill because of a threat of lightning. In fact, there was a tornado warning for the evening, which had me wondering just what the heck to do, if our house was strong enough to last through a tornado, do we have supplies, will we be safe, etc etc. etc. The warning lasted all of 45 minutes but was enough to keep me inside on the treadmill that night. I opted out of the strides because they are 25-30 seconds of sprinting followed by two minutes of a slow jog – repeated 10 times. I just felt so much button-pushing on the treadmill was not worth it, so I switched to a 3-7-3 tempo format with the 7k run at 5 min pace. Thursday, it was overcast and cool but at 13-15C, it was a beautiful evening for a run when I got going on a 16k effort. I tried to keep it at 6:20 per km but came in at 6:10 per KM. I read that the training pace needs to keep slow in order to 1) log the time and get your body burning fat on the aerobic jaunt and not producing lactic acid (more on that later in the process – when I figure it out! and 2) not burn out. But the temperatures made for a comfortable run on my favourite route, which takes me adjacent to the Kennebecasis River. Ironically enough, as I ran, Saint John-like fog had rolled in and the river was a blanket of white. Saturday was a crazy day at our house as were prepared for my oldest daughter’s 10th birthday party – Double digits, big time effort. So we hosted a sleepover for eight of her friends and my youngest daughter. It all went well as could be expected and I even had time for an 8k recovery pace run starting at approximately 4:45 p.m. before everyone arrived. I got going on a nice pace, again a little quick but not too bad. After just one km, the clouds opened, sprinkling with a light rain. Not bad, I thought. Refreshing even. At 1.5 km though, it really started to pour and at 2 km, I heard the first rumble. It was distant but distinct. I thought I’d go 500 more metres, possibly another km and turn around to cut it short to 6km overall. A 2.5 km, the rumbles grew in volume and at 3 km, there was a none so subtle ‘BANG’. I sprinted for cover outside a local restaurant, and waited and waited and waited for the storm to let up. Finally, after 20 minutes and with no relief in sight, I called for a drive home. 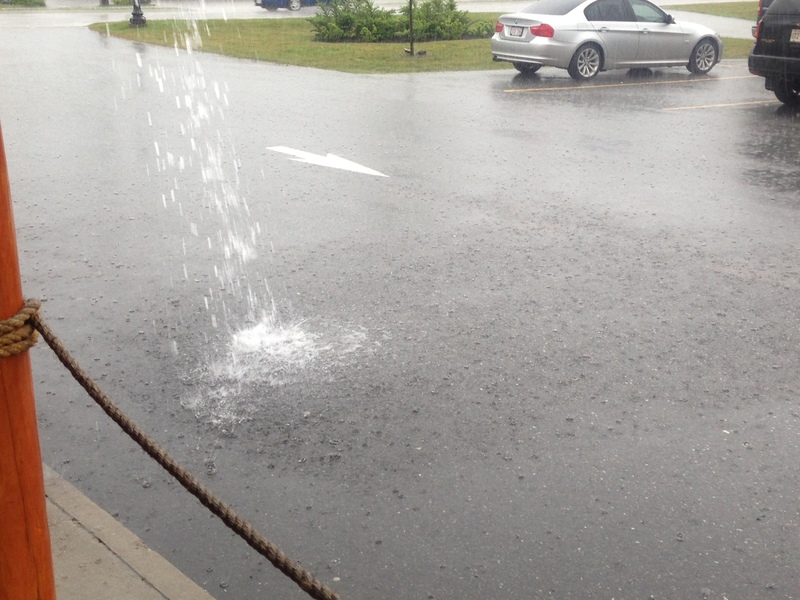 The rain was so intense, it was streaming off the roof of the restaurant – see the picture above. The rumbling lasted another 30-45 minutes but by then, the birthday guests were arriving. So I cut it short – 3km run. After the excitement, came another one of those Pfitzner tests – a 21.1 km long run with 13 km at marathon pace on Sunday. For me, that meant a 5:36 km effort from the 4km mark to 17 km, achievable but after not doing that pace for that distance for a while, not a given. The key was to hit the time pretty well right on and not attempt to bank time, as I did in Moncton last year, a strategy where I ultimately paid dearly. But when you are feeling good and can go with the speed of the day as warranted by conditions and your energy level, it is hard not to run at the faster pace. This will be the biggest challenge in training, I figure – running disciplined. Safe to say, this is a lead in to report I was not disciplined Sunday, completing the entire 21.1 km route, warm ups included at 5:36 or 1:57.4x. My warmup 4 k splits were 6:01, 6:13, 6:08, 6:07 – a tad faster than the 6:25 I was hoping for. 5:34, 5:31, 5:45, 5:24, 5:24, 5:16; 5:26; 5:12; 5:16, 5:18; 5:13: 5:09; 4:55. This was about three minutes, 35 seconds, or almost 16 seconds per km, faster than I should have been. 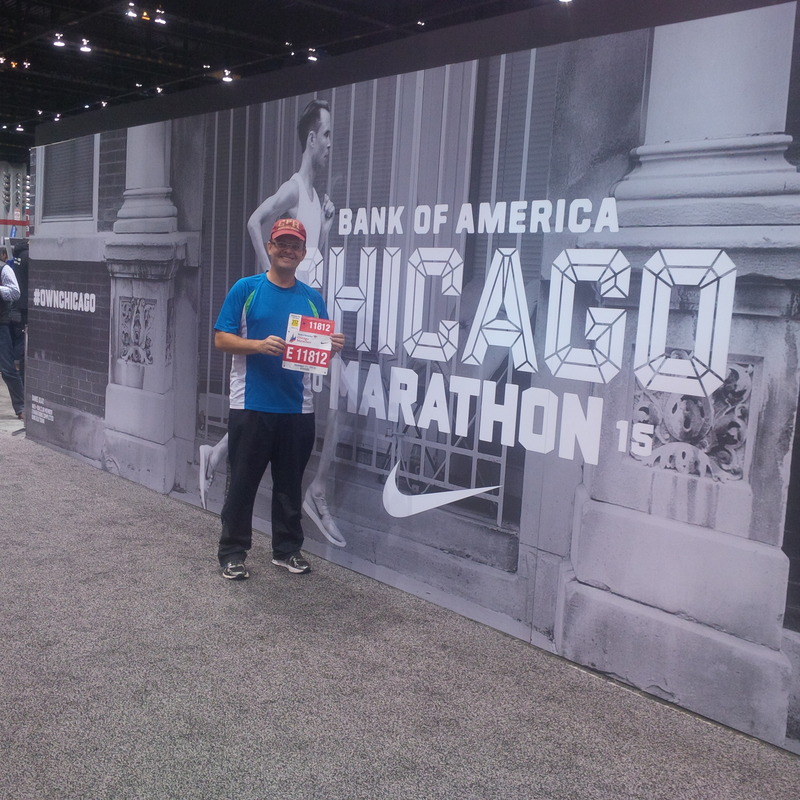 It might not seem like a lot, but over the course of a full marathon, this will be a killer. I know first-hand. Looking at the splits, I suspect I felt nervous after that 5:45 time and decided I did not want push it so close the rest of the way. The final 4 k were a shade under 6:00 coming home. Overall, I felt good, really good for the first half I’d run in more than 6 months and 8 k of that half was at a slow pace. But after the 17th K, I was feeling it and was more tired than possibly I should be to end Week 2 of training. 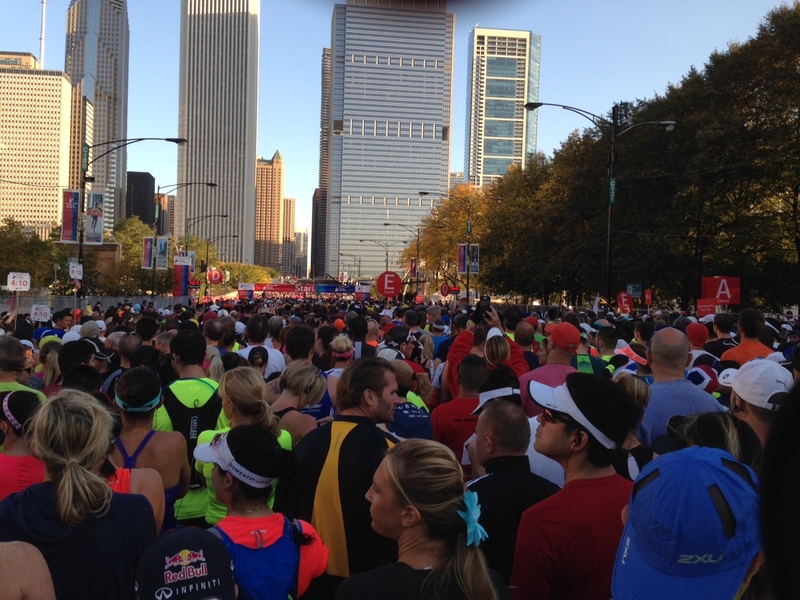 So the next big test for marathon pace is in three weeks. We’ll see if I can use this lesson and come closer to the goal of 5:36.